Our practice-based, innovative Sport and Exercise Nutrition BSc degree will provide you with the underpinning scientific knowledge of nutrition, science and physiology for sports performance, exercise and health. This course is based at our recently extended £71 million City South Campus in Edgbaston, Birmingham and is approved by the Sport & Exercise Nutrition Register (SENr) to ensure that the knowledge and competencies are aligned with professional standards. You’ll study nutrition and exercise at both ends of the spectrum, from assessing professional sports teams to health-based clients with specific nutritional issues. It’s a chance for you to gain experience in developing nutritional strategies that aid performance, health and wellbeing. 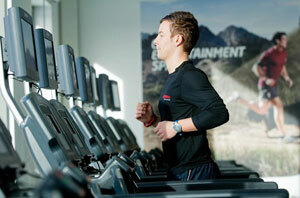 You'll undertake physiological and nutritional assessment of sports performers in our state-of-the-art laboratories. However, it's important to know that the course isn’t just about analysing elite athletes - you'll also have the opportunity to learn how nutrition and exercise can impact upon people with different physiques and states of health. Upon graduating, you can apply for jobs as a performance nutritionist, as well as within other areas of sport science, health and fitness. We also boast partnerships with both Warwickshire Cricket Club and Sport Birmingham. These partnerships not only keep our courses fresh and relevant, they also provide valuable placements, trips and case studies for you and your fellow students. This course is endorsed by the Sport and Exercise Nutrition register (SENr). There will be live projects to work on, as well as compulsory work placements, enabling you to gain first-hand experience and build your knowledge. You'll receive talks from guest lecturers who work within the sector and can provide relevant, up-to-date advice. There will be an opportunity to engage in international exchanges, as well as trips and visits that will aid your course. Many of our staff are PhD-trained and remain active in their chosen fields. You'll work in state-of-the-art nutrition and dietetic laboratories, building your skills and knowledge. Check out our sport facilities, clubs, athlete support and weekly activity sessions that are offered here at BCU. A minimum of 5 GCSEs, including Double Science, Mathematics and English Language at Grade 4 (formerly a C) or above. No equivalents will be accepted. Irish Leaving Certificate, a minimum of five Ordinary levels at Grade B3 or above, must include English, Mathematics and a Science subject. Scottish qualifications, a minimum of five Intermediate Standard 2 or above, must include English, Mathematics and a Science subject. A Level: To include one subject in Biology / Human Biology / Chemistry / Physics / Physical Education / Applied Science / Psychology / Social Science with minimum Grade C. A typical offer would be BBC. General Studies not accepted. Access to HE: Sport or Science related pathway with 60 credits overall and 45 credits at level 3. A minimum of 30 Level 3 credits must be at distinction. Must include Mathematics, Sciences and English Language GCSE at Grade 4 or equivalent prior to application. Irish Leaving Certificate: 112 UCAS tariff points from a maximum of 5 Highers with at least 4 subjects at Grade B2 or higher and 1 subject at B3 or higher. Must include sport, health or science related subjects. Scottish Qualifications: Maximum of 5 Scottish Highers and 3 Advanced Highers at Grade C or above to achieve 112 UCAS tariff points. Foundation degrees will be reviewed on an individual basis and will require a transcript of the content of the course. International Baccalaureate: Obtain a minimum of 28 points overall with grade 4 or above in at least one Higher Level subject from Group 4. Applicants who have not received their secondary school education in English will require an overall IELTS score of 7, with no subtest below 6.5. Applying for a course and preparing for an interview can be a daunting process, so we have created a series of films to help you through the process, including what to put in your personal statement. This module aims to consider the underpinning biochemistry and physiology of nutrition for health, exercise and sports performance. You will also explore the link that nutrition has on a variety of sport, exercise and health settings – providing you with the fundamental knowledge for further study in these areas. This module covers the process of research and enquiry in the discipline of sports and exercise science, nutrition, sports therapy, and PE and School Sport. It provides guidance on how to interpret scientific literature, so that you can find relevant sources of information for a study or an assessment, gain an understanding of different sources of information and consider how knowledge is generated. This module aims to provide you with the underpinning knowledge of various physiological systems in the human body, and key training principles, which relate to sport and exercise. You will be introduced to the concept of the body working as multiple interrelated physiological ‘systems’. Whilst each system has its own independent function, the function of one will have a direct impact on the function of another and will subsequently impact upon sports performance or health. This module aims to provide you with an introduction to the core practical competencies required in sport and exercise nutrition. You will consider a vast array of nutrition-related measurements including: energy balance (intake and expenditure); anthropometrical assessments; body composition, methods of assessing dietary intake; and both physiological and biochemical markers of nutritional status. This module provides an introduction to human anatomy, relating to structures, properties and functions of bones, joints, tendons, ligaments and muscle, in relation to the mechanical principles, which govern human movement. The primary purpose of this module is to introduce the mechanical principles that govern human movement and thus equip students not only with the ability to observe and measure human movement (i.e. to describe movement), but also to begin to understand the mechanisms by which human movement is controlled and effected (i.e. to explore why we move the way that we do). This module will consider the link between nutrition and training and competition for sports performance. You will be able to empirically study the effect of nutritional strategies on sports performance across a range of performance types (e.g., strength, power, endurance). The efficacy of the nutritional strategies will be examined in relation to findings of previous studies. This module will consider the link between nutrition, dietetics and health. You will be able to empirically study the effect of nutritional strategies on acute and chronic health issues (e.g. obesity, type II diabetes, CVD etc.) and consider the efficacy of the nutritional strategies to manage these issues in reference to contemporary research. The module aims to assist you in gaining a more critical understanding of the research of others and to act as a complement to other second year modules you will be studying. It will also directly prepare you for undertaking your own research at Level 6. This module will focus on combining your sports nutrition and employability skills in a real-word scenario. In this module, you will gain first hand insight into the working environment of nutrition, whether that be in sports performance, exercise and health, or clinical settings. You will develop and utilise your scientific skills in a real world setting, which will enhance your problem solving skills and adaptability to multiple scenarios in a professional setting. This module aims to provide an insight into the strategies that can be used to analyse and quantify sports performance in a valid and consistent manner to help inform training and match-play decisions. Specific focus is placed upon the process of conducting a comprehensive needs analysis of a sport including tactics, techniques, and bioenergetics. This module aims to develop your understanding of nutritional referral and long-term behaviour change. As a nutrition professional, it is essential that you are able to act within the limits of your knowledge, skills and experience and if necessary, refer your client on to another professional. Additionally, by understanding the multi-dimensional factors that influence long-term adherence to healthy eating, you will be well-placed to ensure you are able to provide effective nutrition support. The module aims to provide you with the skills required to work in a sport and exercise nutrition setting. You will undertake a year-long ‘case-study’ where you will provide nutritional advice and support to an athlete, team or health-based client. This module provides you with the opportunity to design and carry out a substantive piece of independent research which is focused on an area of interest related to your programme of study. This in-depth, self-managed study will encourage you to examine a critical issue from your sector or discipline. The sport and exercise nutrition course will be a mix of work-based placements, enabling you to build your knowledge and gain first-hand experience, and assessments. You'll have the option of taking a sandwich year between Year 2 and Year 3 of study. You can gain international insight and experience a new culture with our Erasmus exchange programme. Students have spent a term at a number of major institutions, including the University of San Diego in the USA, as well as destinations in Cyprus and Denmark. Within the course, there will also be the opportunity for international exchanges. Trips and visits will play a significant part in all of our Sports courses. Alongside your placements, you'll have the opportunity to visit other sporting institutions and teams, both within the UK and internationally. The sport and exercise nutrition course covers a variety of sectors, so you'll be able to secure employment in a number of roles. You could work in clinical practice, working for professional sports teams and performers. Or you could work in the health sector, where you’ll aid members of the public with specific dietary issues. Placements play a significant role in this course, helping you to build up your experience and knowledge of working within the sector. Career opportunities could see you work as a sports and exercise nutritionist, work for a professional sports team or set up your own practice. The creation of our new suite of courses in Sport and Life Sciences is yet another exciting development at Birmingham City University. The 10,500sq metre building at City South Campus will enable us to offer a wide range of new health, nutrition, biomedical science and sports courses, as well as providing a new home for our education programmes. Not only are we investing £41 million in a new building to house the laboratories and teaching spaces needed, but we also plan to open up these facilities to benefit all students and the wider community. This will complement our existing sports facilities, which already provide a base for students to compete in activities ranging from rugby to . The courses will reflect the latest developments in our teaching and our focus on practice-led learning with work placements and live industry case studies incorporated into the curriculum. All courses have been co-designed with employers and are endorsed or accredited by professional bodies where appropriate. By expanding our provision to these new areas, we will be helping to tackle some of the biggest challenges facing society today, such as obesity and unhealthy lifestyles, by encouraging and supporting healthy eating and greater physical activity. In addition, we will be producing graduates who can support elite performers in meeting the UK’s ambitions for sporting success at events such as the Olympics and other world sporting tournaments. We are constantly looking to enhance the range of courses we offer - please check all our courses for the latest additions to our portfolio. The Seacole library, based at City South Campus, is one of the UK's largest specialist health education libraries. The facility offers an extensive range of range of information and reference materials set out in a relaxing environment, conducive to studying. There are comfortable seating areas, group study areas, a silent study area and private study rooms. Our PCs are also designed to support students who may have difficulties with reading and writing, featuring specialised software with zooming/magnification and screen reading capabilities, which may also be customised for individual student needs. The IT Suite offers extended opening hours and is supported by a specialist Open Access Assistant during term time. In addition to the open access PCs within the IT Suite, there are 12 networked student PCs available within Seacole library. Our £8.5 million Doug Ellis Sports Centre boasts an 80-station fitness suite, an eight-court sports hall, and workout and spinning studios. 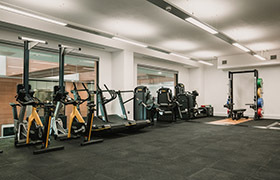 The centre offers state-of-the-art fitness training equipment and plenty of room for team sports including five-a-side football and cricket. An all-weather pitch adds the finishing touches to the centre, which is located close to our City North Campus. Visitors to the gym can choose a personalised fitness programme, instructed by qualified fitness trainers, and take advantage of a selection of classes, such as yoga, salsa or body combat. Many of our PhD-trained staff have incredible industry links and a wealth of experience, and often continue to work in their specialist areas. As a registered sport and exercise nutritionist, Matt has provided nutrition support to a variety of elite athletes and teams, as well as being part of the anti-doping team at the 2012 London Olympic Games. Jennie has applied experience of working in the sports nutrition industry, predominantly within elite Football and Cricket. Her role involves working with athletes to maximize sports performance. Jennie is passionate about providing education in the field of sports nutrition, with an insight into applied sports nutrition. Jennie studied her undergraduate at Sheffield Hallam University in Nutrition and completed a postgraduate in Sports Nutrition with the International Olympic Committee. She is registered with the SENr as a High Performance Sport & Exercise Nutritionist.